EDGEWATER AMUSEMENT PARK Detroit picture photo print art poster for sale. 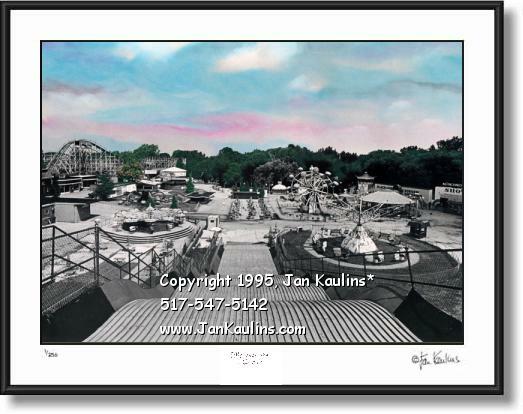 This historic Detroit Edgewater Amusement Park picture photo was made from an original BLACK AND WHITE HISTORIC PHOTO THAT HAS BEEN HAND-COLORED and printed by artist/photographer Jan Kaulins. Old Edgewater Amusement Park, Detroit's westside funland for more than half a century opened in 1927 during the Depression. We're sure that Detroit Edgewater Amusement Park was responsible for an untold number of romances. Always a good place to hang out, everyone had fun. The 20-acre park, located close to Grand River, was in the northeast corner of Telegraph and 7 Mile. It was operated for many seasons by Milton and Cyril Wagner. With the advent of the super highway and birth of multimillion dollar theme parks like Disneyland, its popularity waned. In September of 1981, after 54 years of operation, Edgewater Park's turnstiles clicked for the last time. This quite rare and wonderful Detroit Edgewater Amusement Park picture photo is offered exclusively here by The Detroit Photo Gallery. In this Edgwater Park Detroit photo we can see the rickety Wild Beast Roller Coaster at the left edge of the photo, as well as the many other rides and shows, including the ever popular Ferris Wheel. This is one of the very last photos taken of Edgewater Amusement Park before it finally closed its gates in 1981. It is a wonderful photo to remember fondly time spent at this West Side Detroit landmark. TO SEE THE MANY OTHER DETROIT PHOTOS AVAILABLE IN THE DETROIT PHOTO GALLERY, JUST CLICK ON THE 'HOME--Return to All Galleries' LINK BENEATH THIS PARAGRAPH.